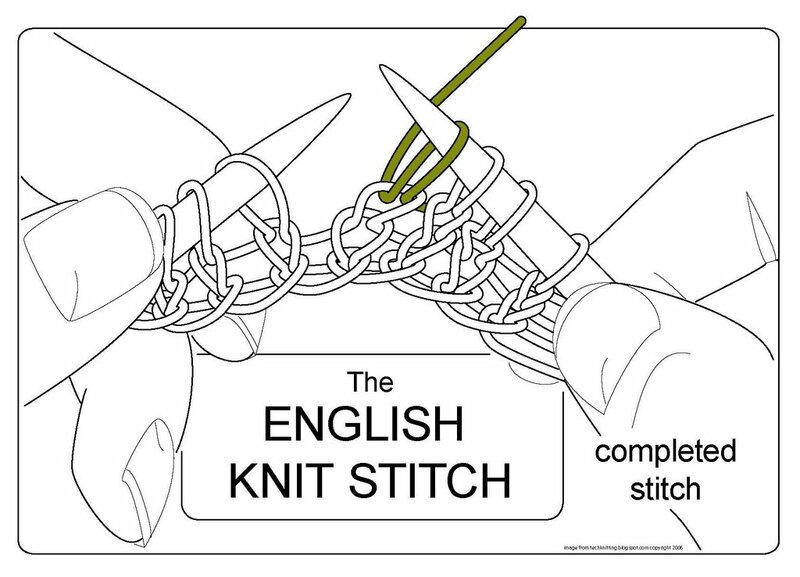 The English knit stitch differs from the continental knit stitch in only one detail--which hand supplies the yarn. 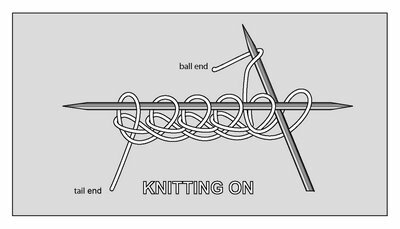 In continental style knitting, the LEFT hand supplies the yarn, in English style knitting, the RIGHT hand supplies the yarn. 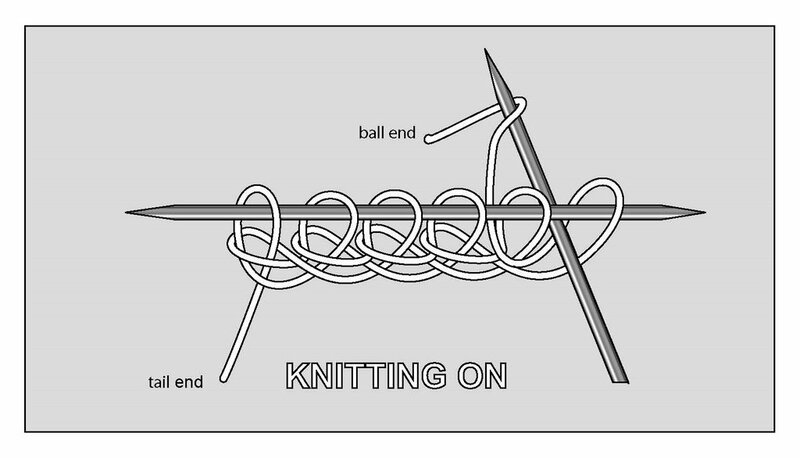 The yarn, however, goes the same way around the needles, and the needles go the same way through the loop. 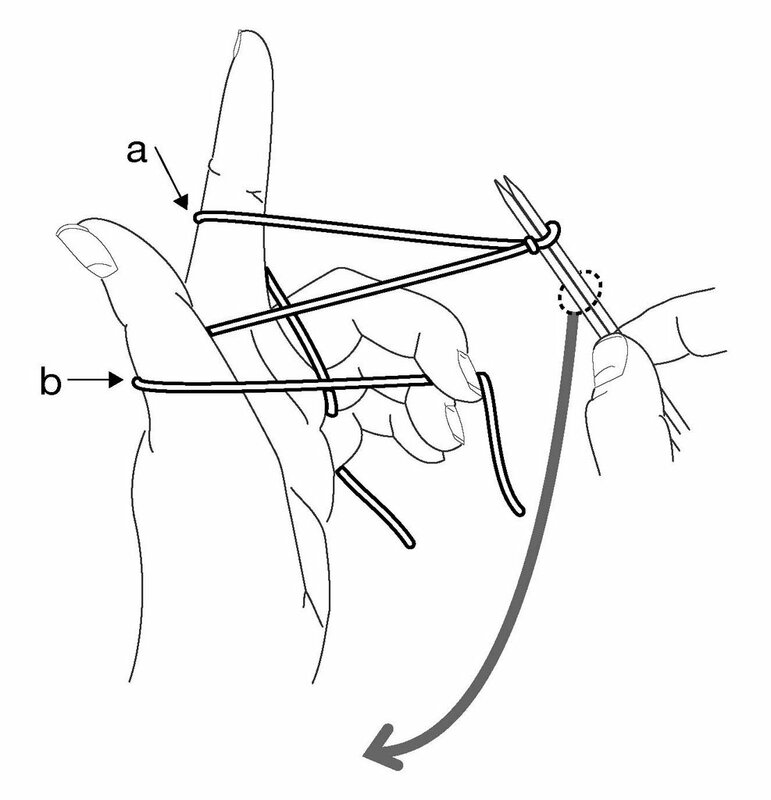 If you are having trouble wrapping the yarn correctly in English-style knitting, look at the three yarn wrapping errors illustrated for continental knitting (ignore the fingers, just look at the way the yarn lays on the needles) link 1, link 2, link 3. 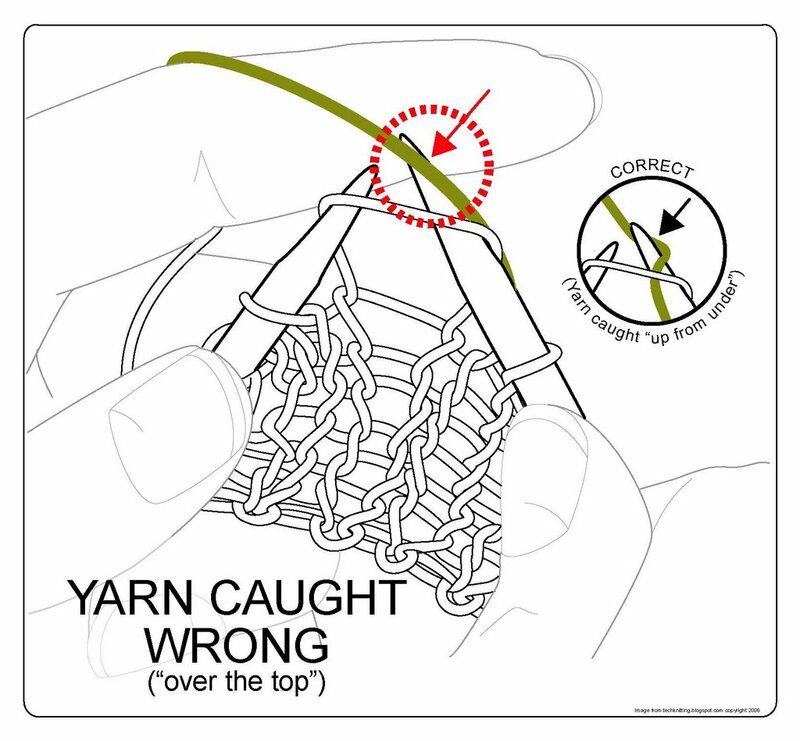 Each of those yarn-wrapping errors is a wrapping error in English-style knitting also. 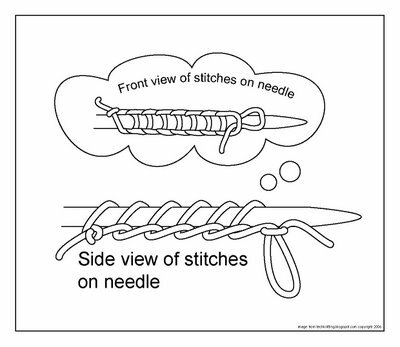 Step 1: The right needle is inserted FROM the FRONT, TO the BACK of the stitch at the tip of the left needle, as shown. The right hand supplies the yarn--the right forefinger carrying the yarn acts as a shuttle, tracing a path in the air shown by the dotted line, above. 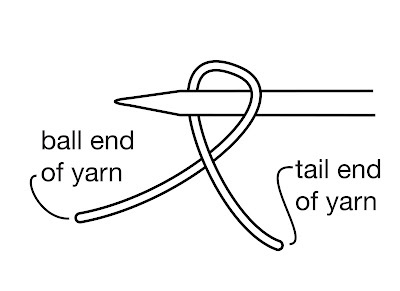 The standing yarn (green) takes the path shown by the solid red arrow, wrapping around the RIGHT needle. 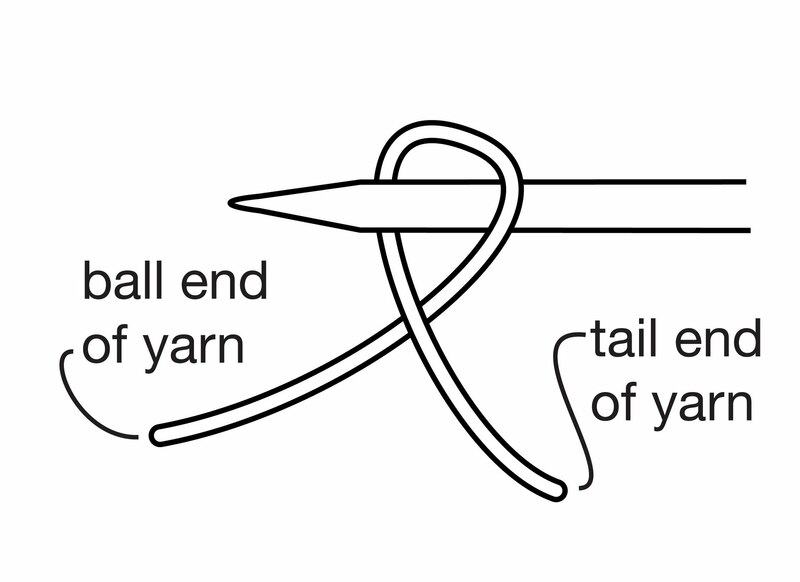 Step 2: Once the standing yarn (green) is wrapped around the right needle, the tip of the right needle draws the wrap "down and through" the stitch at the tip of the left needle as shown by the red arrow. 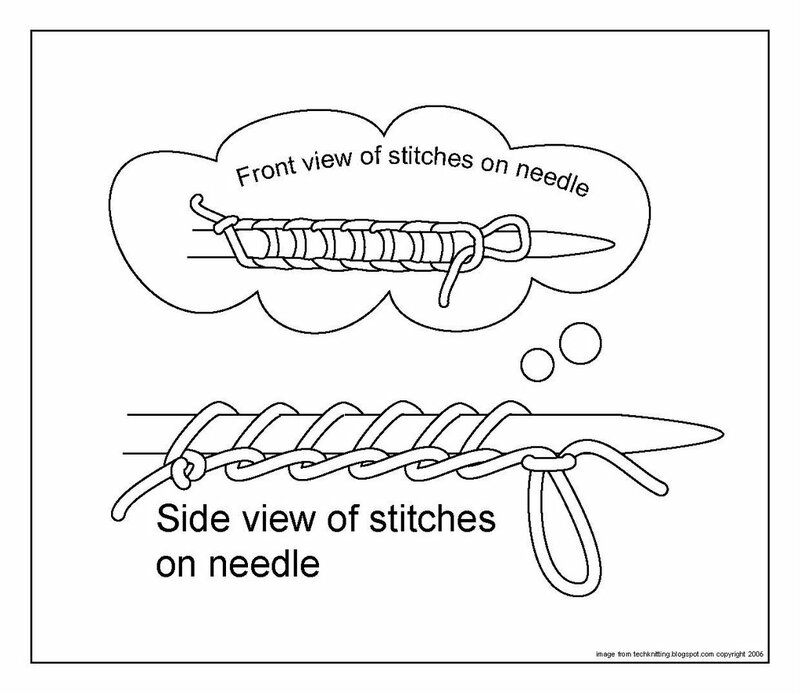 If everything goes right, this is what you will see on your right needle--a new stitch (green) with the right arm forward. 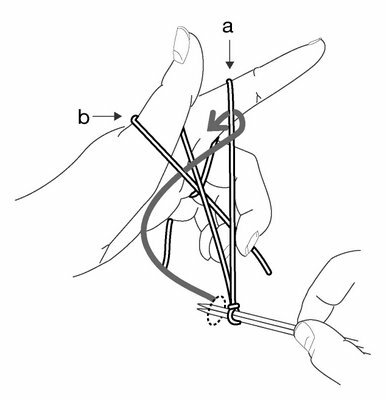 As soon as you master these 2 (3?) stitches, you can make anything at all in all of knitting; cables, picots, stockinette fabric, garter-stitch fabric, lace. 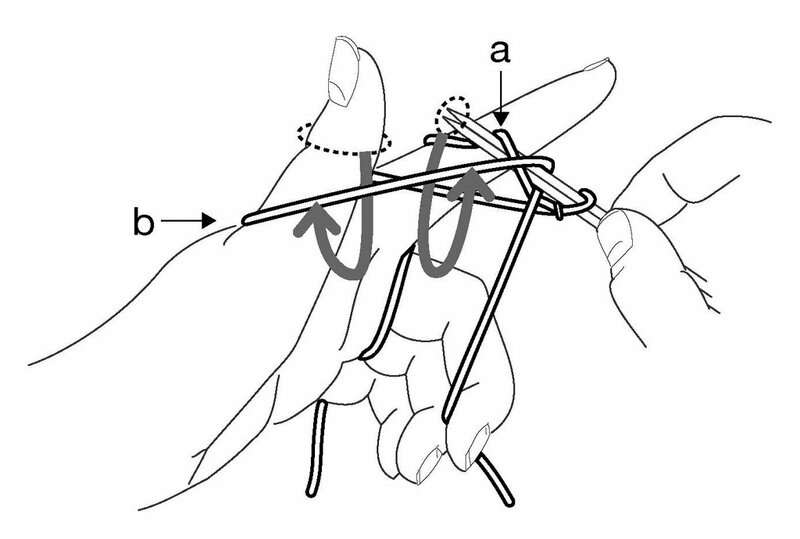 This all seems simple, and, in a zen-like sort of way, it is. 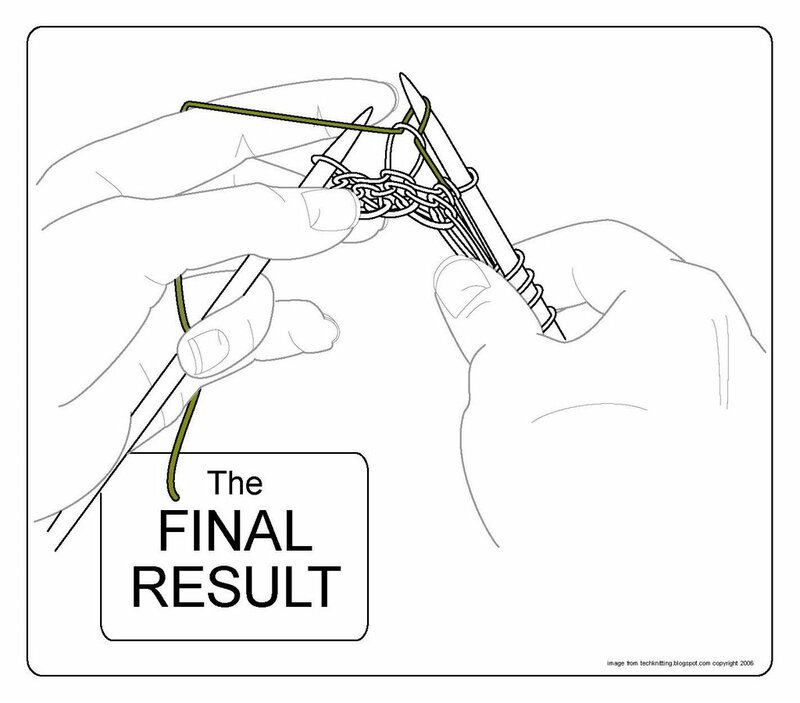 However, the complications soon start cascading and obscuring all. The first complication stems from the split between knitting's two main divisions: continental knitters who carry the working yarn on their left hands, and English knitters, who carry the yarn on their right hands. 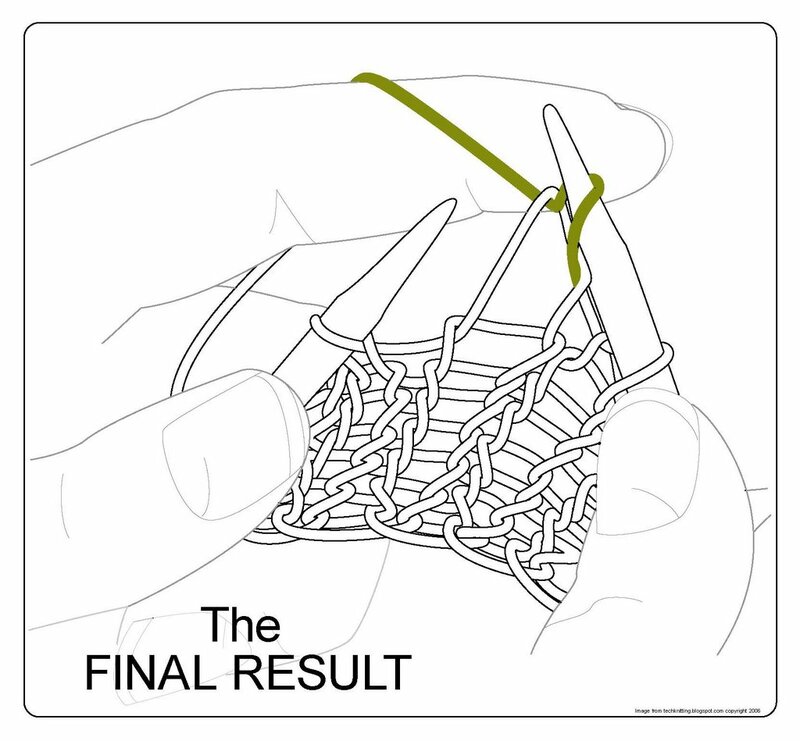 Knitters argue about which method is "better." 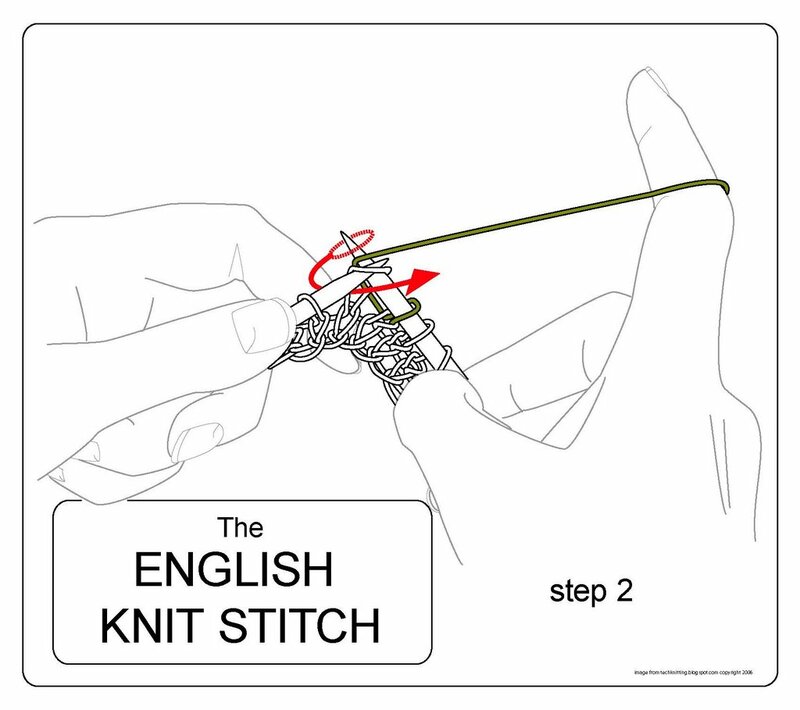 Speed records are set by both kinds of knitters. 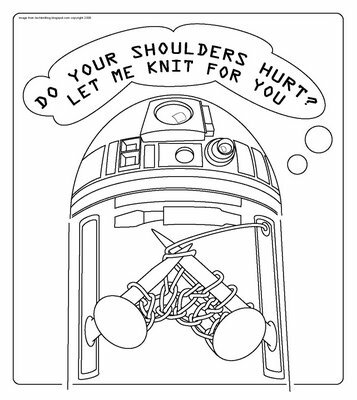 I believe the best way to knit is the way that you, personally, prefer. 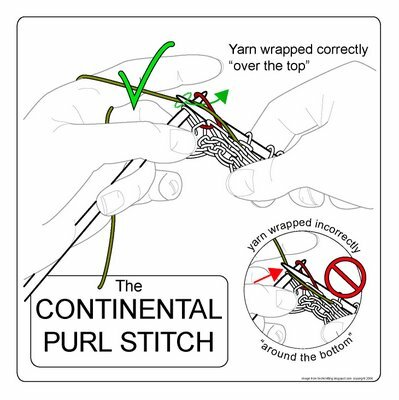 The next 4 posts will illustrate both continental and English knitting and purling--if you don't already know how to do these, you could try them and make up your own mind. 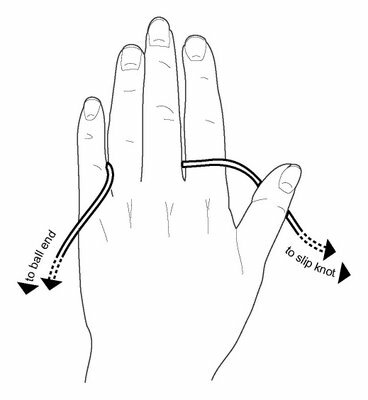 But before the how-to posts, THIS post is about how the continental style and English style differ, and why handedness (left-handed, right-handed) has only a little to do with which style will work better for YOU. 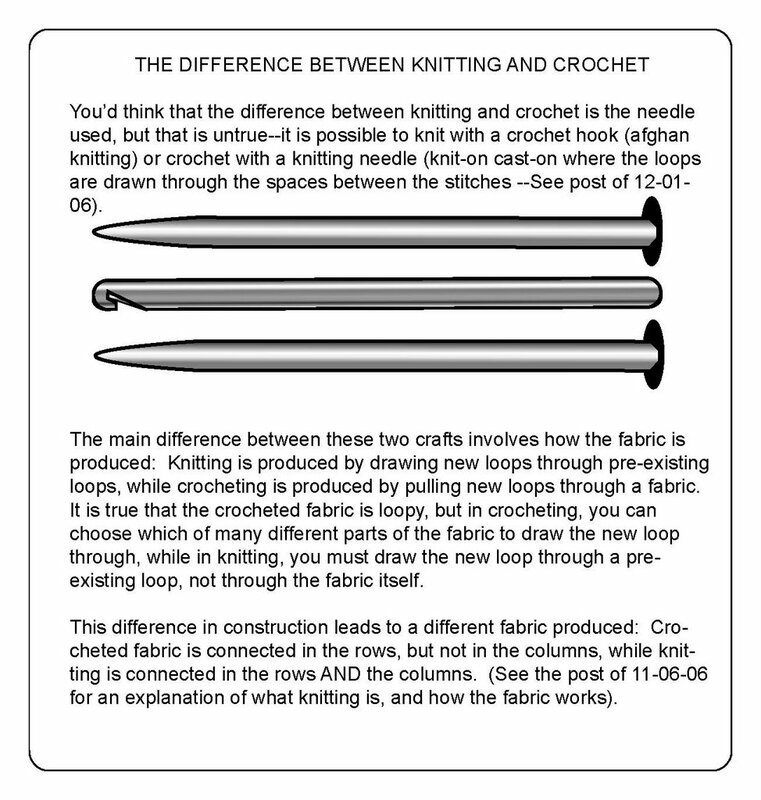 There is a lot of confusion about the difference between continental and English knitting. 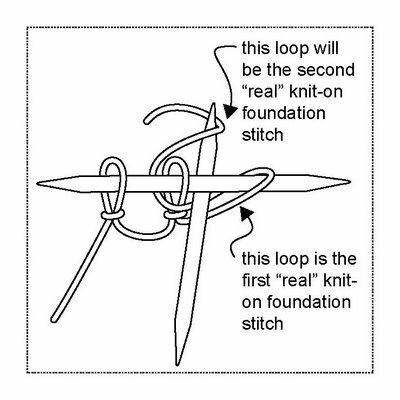 For me, learning to knit continental arose from this confusion. 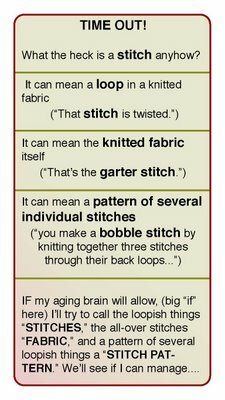 I did not learn to knit until I was 24 years old--old enough to get my own way with my very stubborn mother. 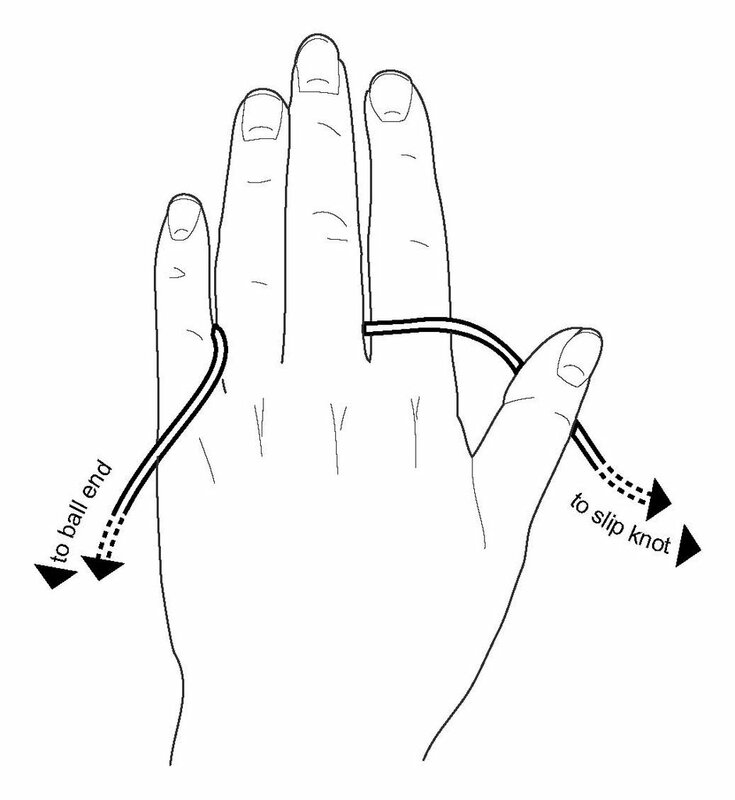 Before that, my mother refused to teach me because she thought she would teach me the "wrong" way--the continental way--which she had learned as a girl in Germany. She thought that I should learn "regular" (English) knitting so I could follow knitting patterns written in English--she thought continental knitting was "backwards" to English knitting. 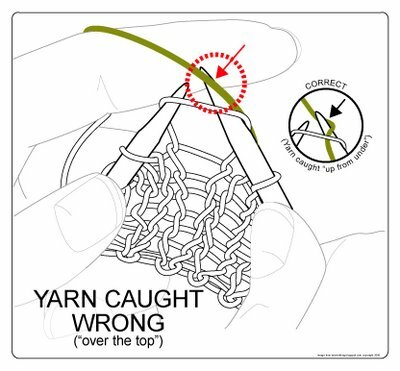 My mom was confused (and did I mention? 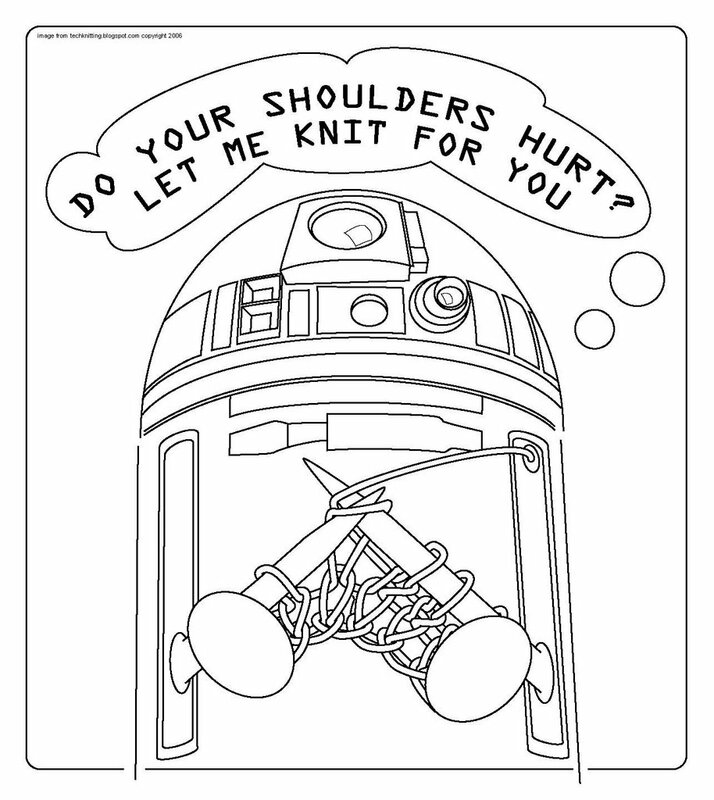 stubborn...). 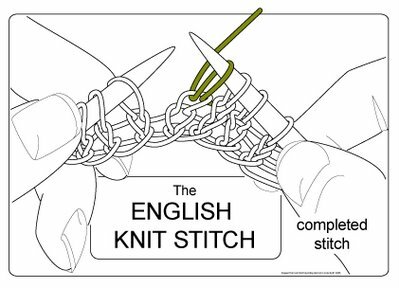 It is true that continental knitting and English knitting differ. 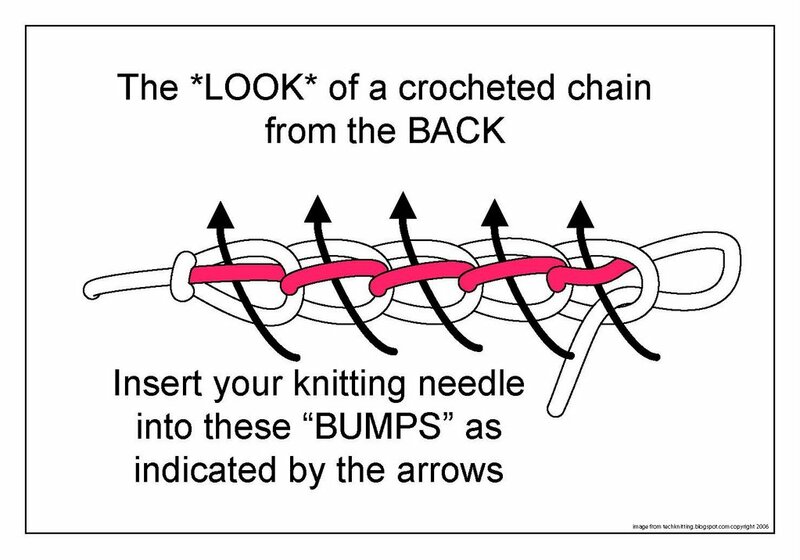 However, the stitch which results--the loop on the needle--is the same (and the same knitting patterns work for both). 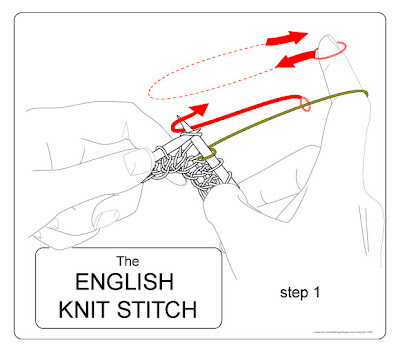 The difference between continental and English knitting arises ONLY from which hand holds the working yarn. 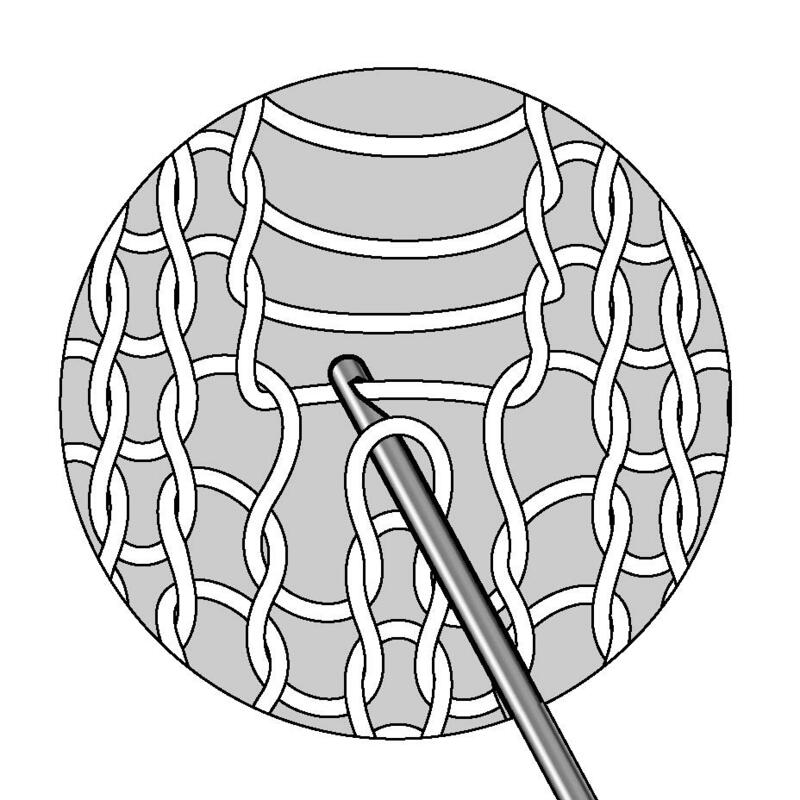 In continental knitting, the working yarn is held on the left hand, so that the tip of the right needle "picks" the yarn to draw it through the loop. 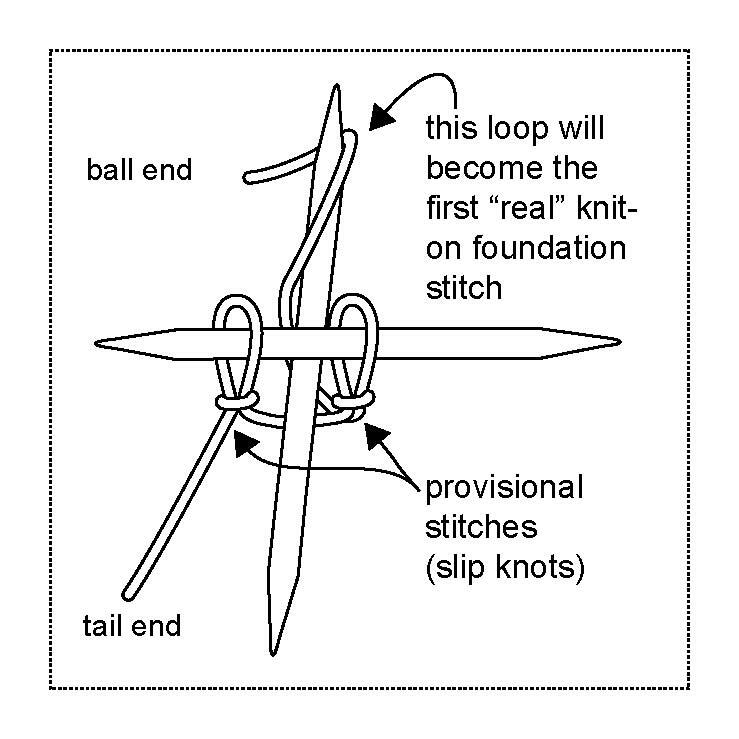 In English knitting, the working yarn is held on the right hand, and the working yarn is "thrown" around the tip of the right needle, then drawn through the loop. 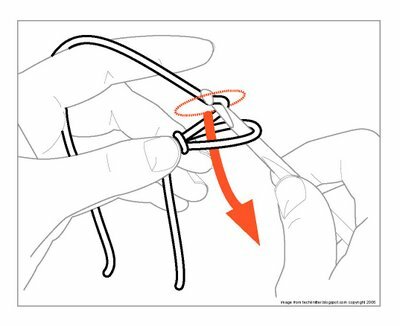 *the tip of the right needle reaches through that loop, snags the standing yarn "up from under," and pulls that snag through the left loop. 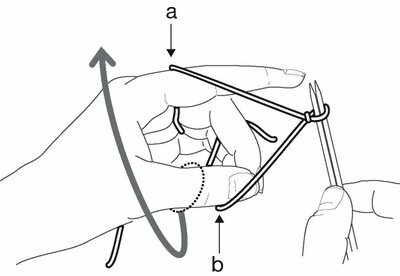 *by this act, two things happen simultaneously: first, as the right needle draws the snag through the left (old) loop, the snag enlarges to become a new loop, second, the new loop is transferred to the right needle. 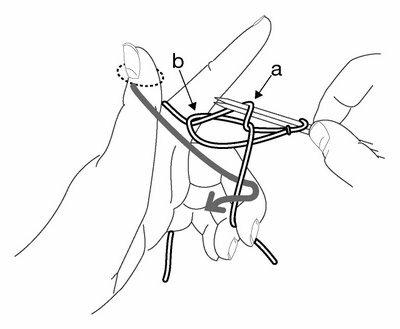 Some think that continental and English knitting have to do with handedness--left handedness, right handedness. That's only partly correct. 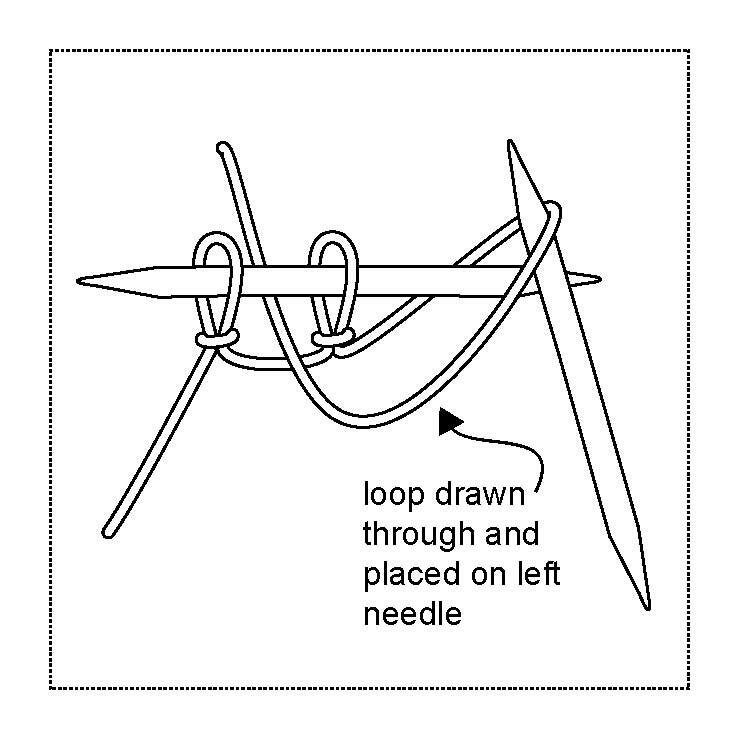 What some call "left- handed knitting" is actually BACKWARDS, a.k.a MIRROR-IMAGE knitting: using the left needle to draw a new loop through a stitch on the tip of the right needle. 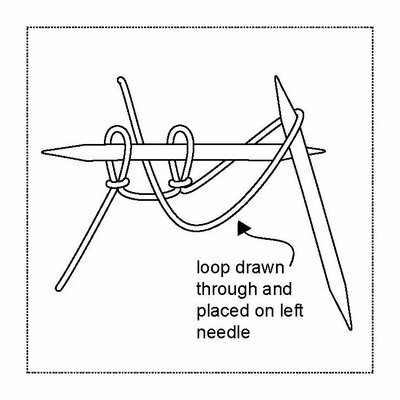 This transfers the new stitch onto the left needle and generally leaves the new stitch oriented backwards--that is, left arm forward. The act of supplying the yarn also changes hands, with the right hand carrying the standing yarn in continental knitting, and the left hand supplying the yarn in English knitting. 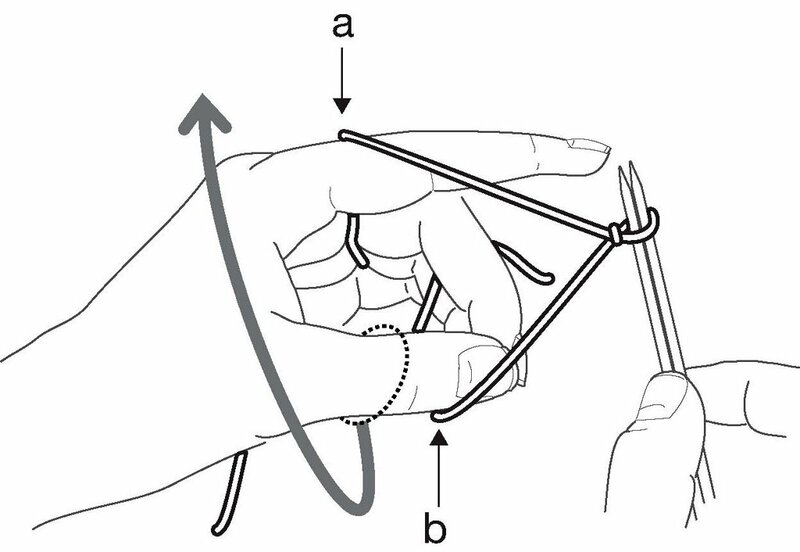 There are knitting teachers who go through a lot of trouble to teach the left handed to knit backwards--the most popular technique is to use a mirror. 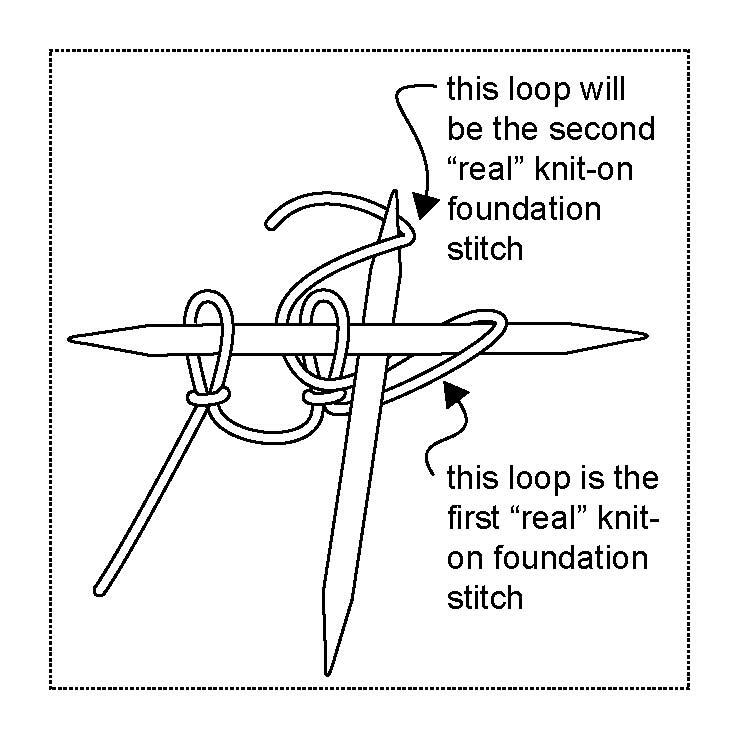 This approach probably stems from a time when there were fewer choices--when people only knew about one way to knit--and presumably thought it self-evident that lefties should knit differently than righties. 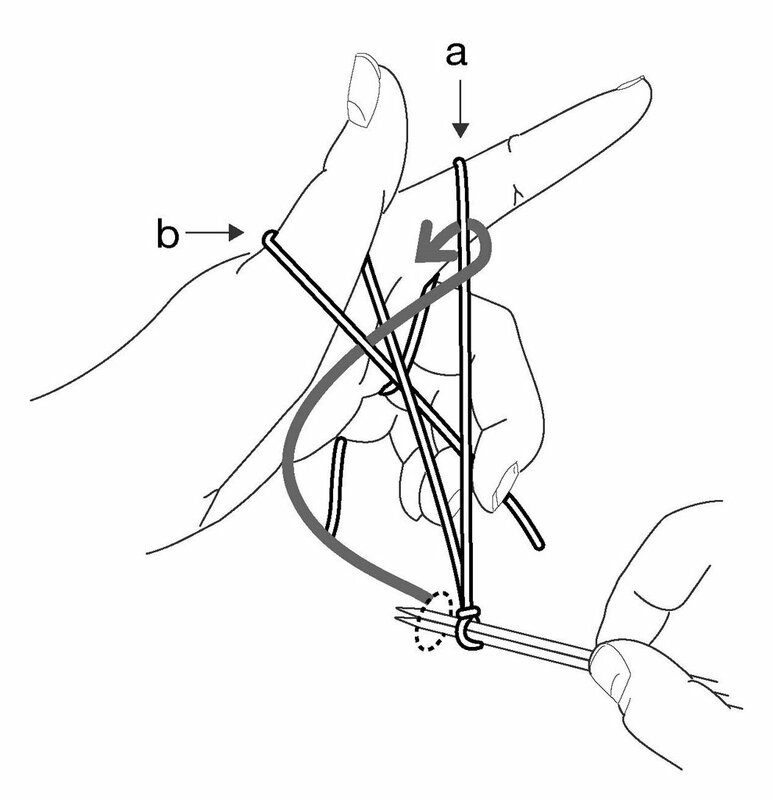 I myself would avoid this approach. 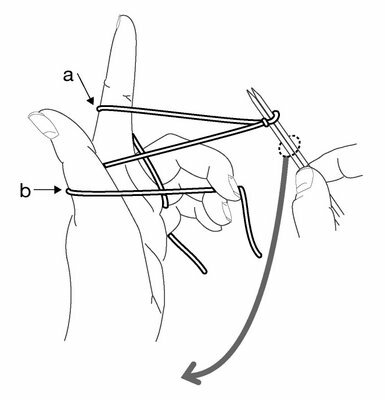 Knitting is (usually, but not always) a two-handed activity--the right-handed have just as much trouble learning to control their left hands as the left-handed have controlling their rights, so the left-handed are (for once) at no disadvantage. 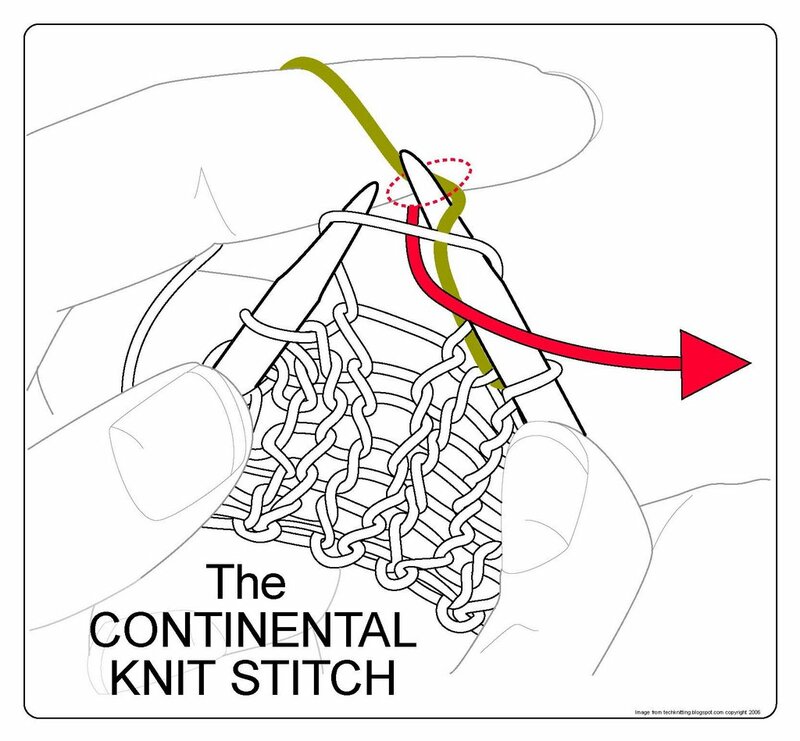 It may be that a left-handed person will be more comfortable with continental knitting--in that style the left hand gets to do more work than in English style. 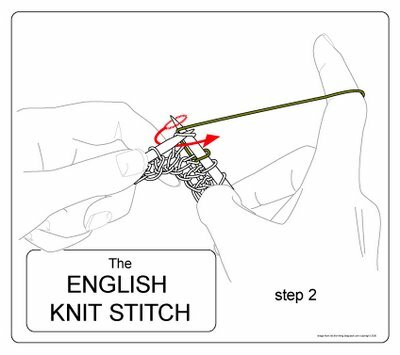 I'd certainly try that before I could be persuaded to teach even the most profoundly left-handed person to knit backwards. 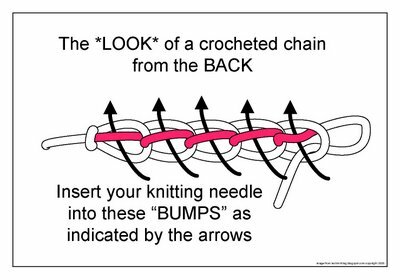 Mirror-image knitters are doomed to a lifetime of transposing knitting patterns, not to mention confusing knitting teachers. 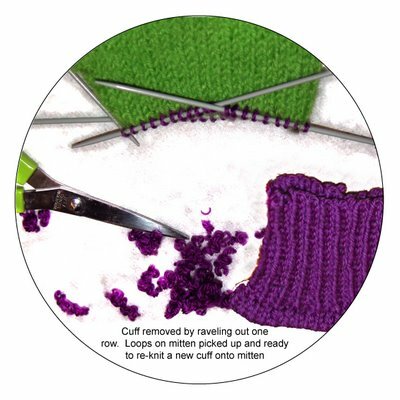 Without transposing, mirror-image knitters' decreases and increases will slant the wrong way and everything'll be backwards--just what my mom feared when she (mistakenly) refused to teach me continental for fear that I'd never be able to follow a printed pattern. To those of you who already knit mirror-image: you have my admiration for your perseverance and persistence in a knitting world which lies, for the most part, sdrawkcab * to you. To those of you who are left handed and have yet to learn to knit: the best way, IMHO, would be to learn the same way as right-handers do--and try continental first. 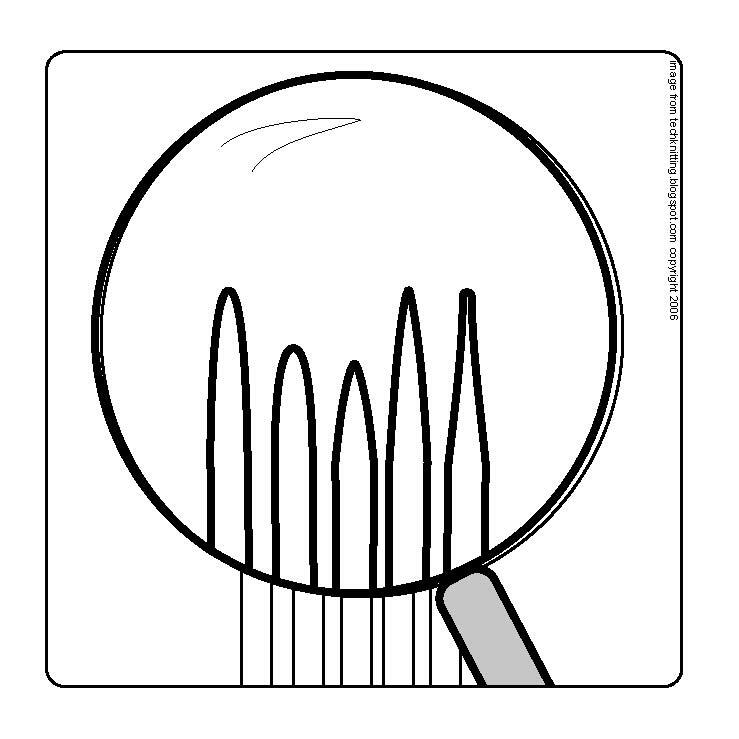 Anonymous asked: "great illustrations, how do you do them?" 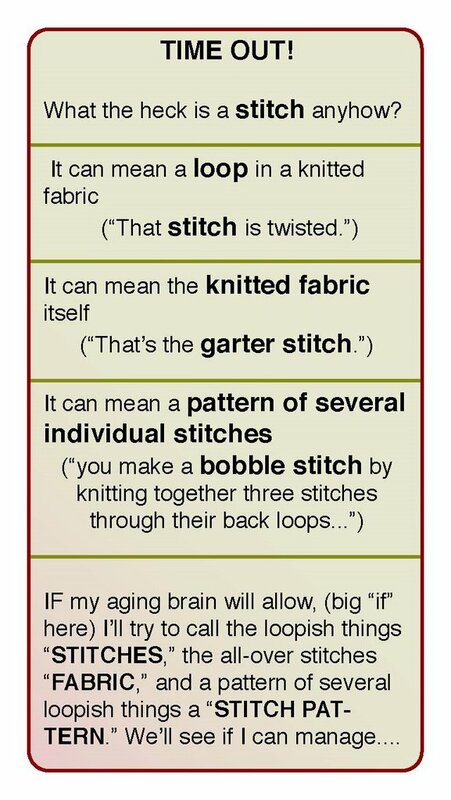 A: For nearly 10 years I've been trying to find the correct format for getting the "knitting tricks" viruses out of my mind (and into yours!) 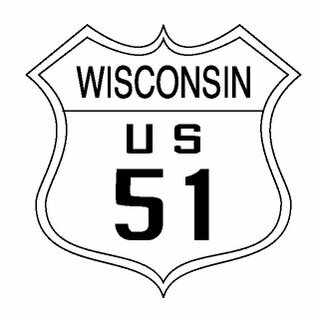 I twice started books (and got several chapters into each) but the book format lacked a feedback loop, and there was no way to keep updating. 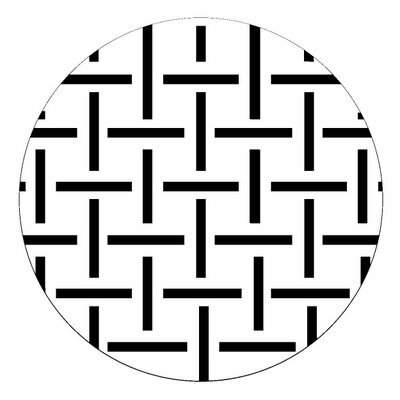 I don't have much to show from those attempts except 1) several bulging files; 2) a bunch of sample garments (many already worn out) and 3) a knowledge of ADOBE ILLUSTRATOR. 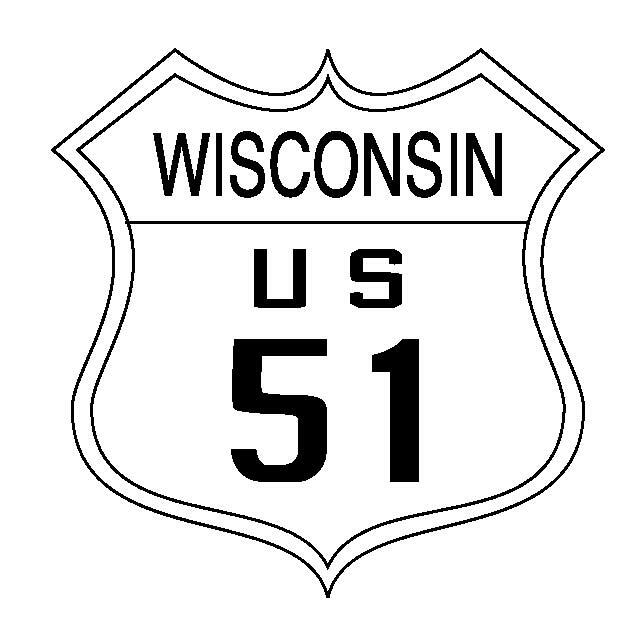 Over the years, Illustrator has taken over my mind to the extent that when I see a highway sign, for example, I imagine how I could reproduce it. 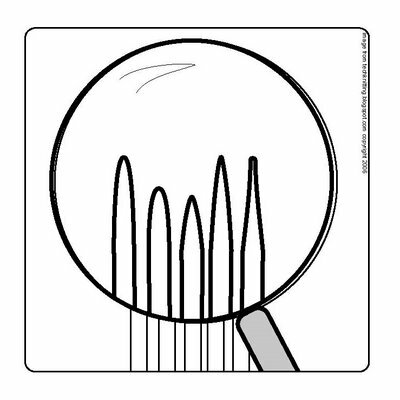 Gardeners say "a weed is a plant out of place." In your lawn, that purslane is a pest, but in the hands of a Italian chef, it's a tasty side dish. It's the same with looping-on. 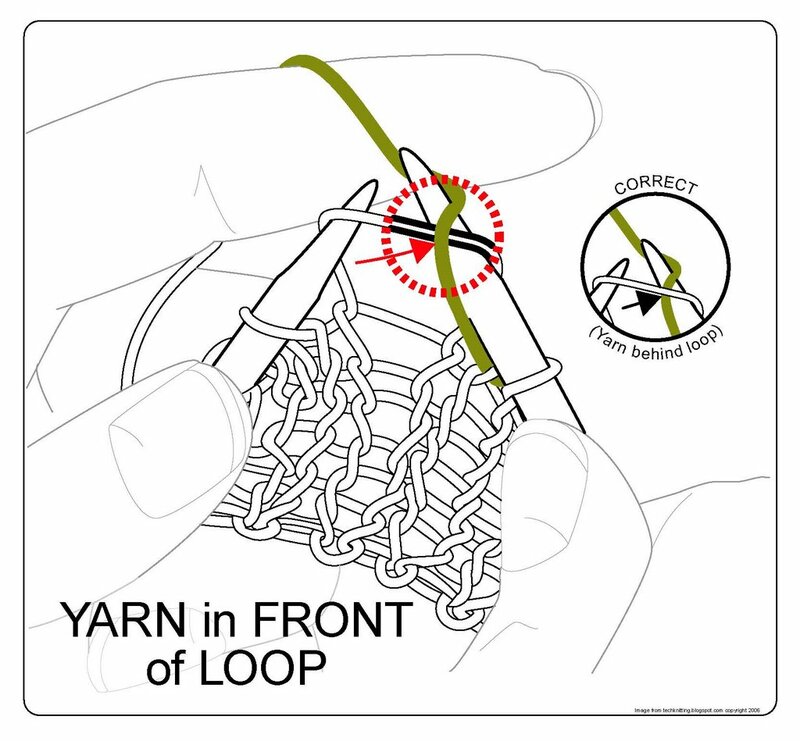 Looping-on is a horrible way to cast on a heavy sweater and a dismal way to start circular knitting. 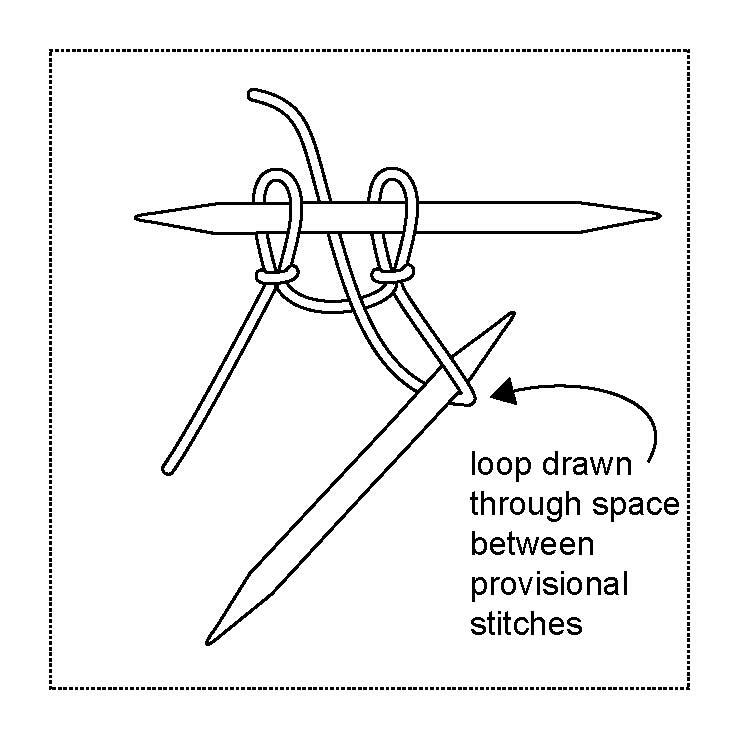 But in the right place, looping on is a valuable technique--the trick is knowing where to use it. 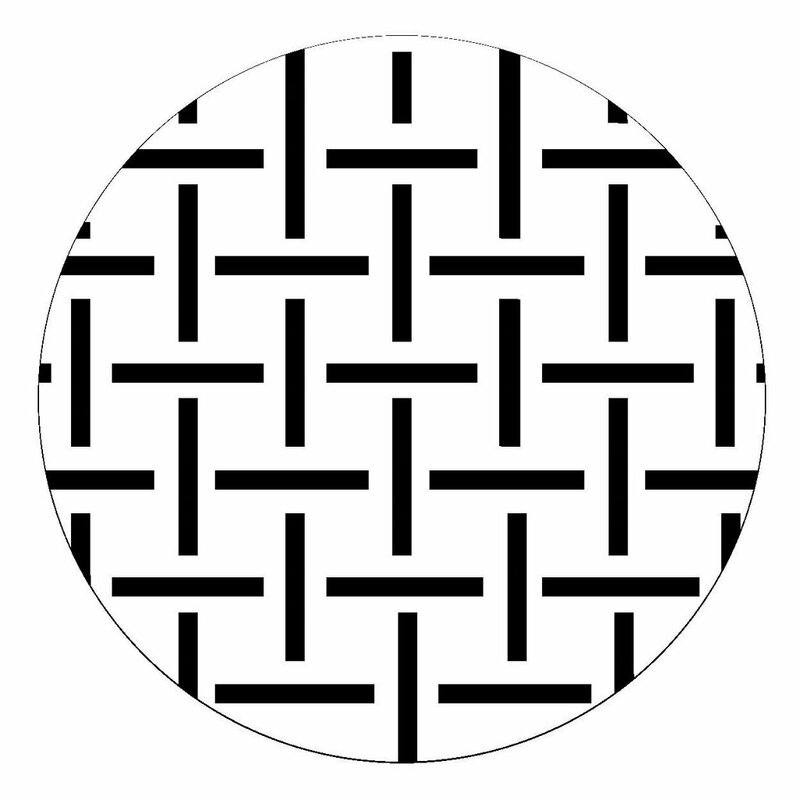 A looped-on edge is fragile: the loops cross and saw away at one another until they break. 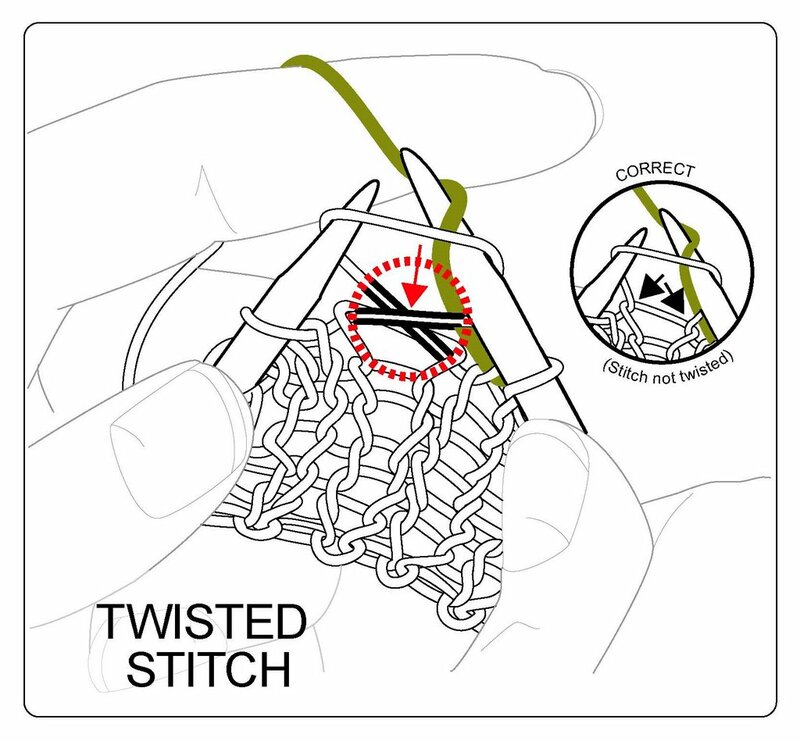 Unraveling sleeve ribbing is a common result. 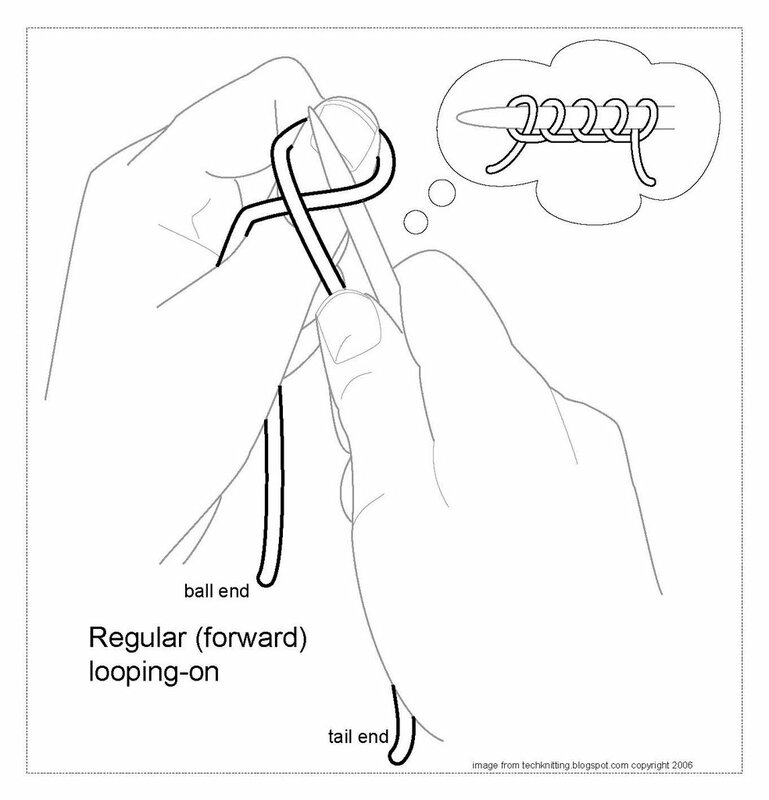 Looped-on loops are skimpy--nothing prevents loops from sharing yarn. 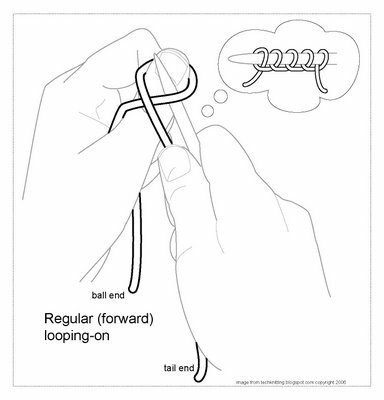 As soon as you put your needle into one loop, that loop gets larger, while the loops around it get tighter. 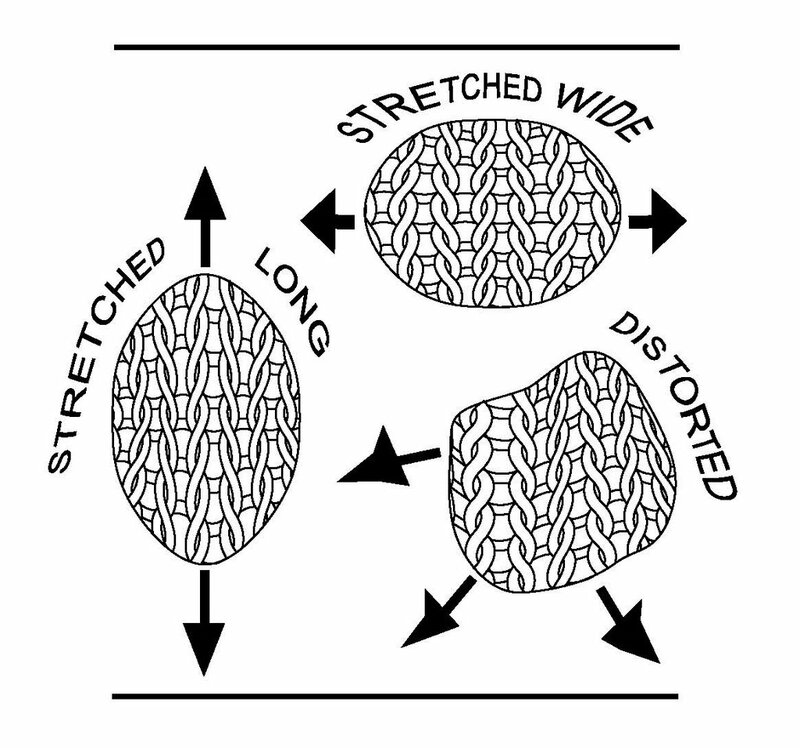 The result: lumpy cast-on. Loooping-on is hard to get "sunny side up" along the needle(s) as you try to connect circular knitting. 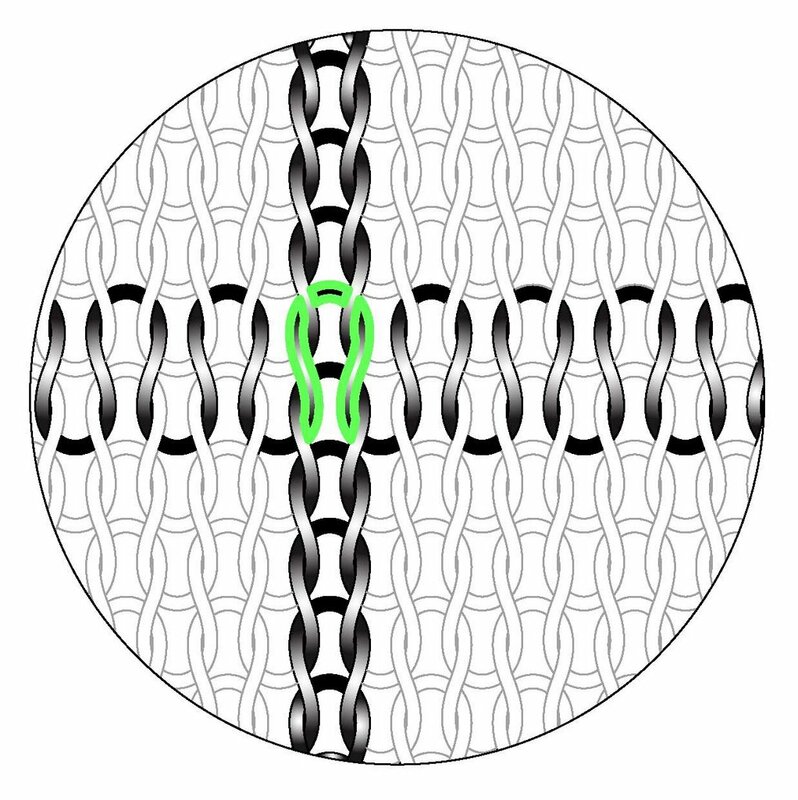 The loops are so skimpy, its hard to tell which way up they lie. 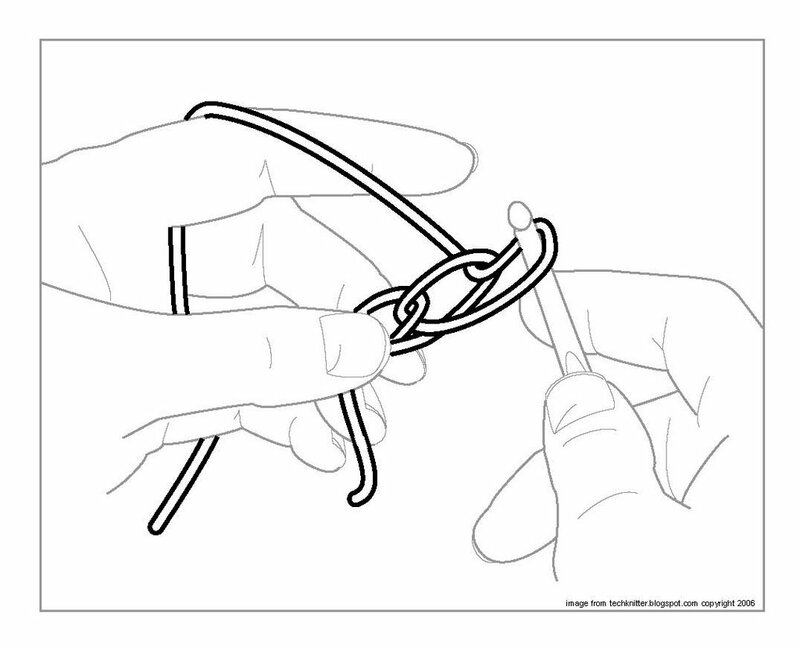 It's easier to make an inadvertent moebius strip with looping-on than with any other method. 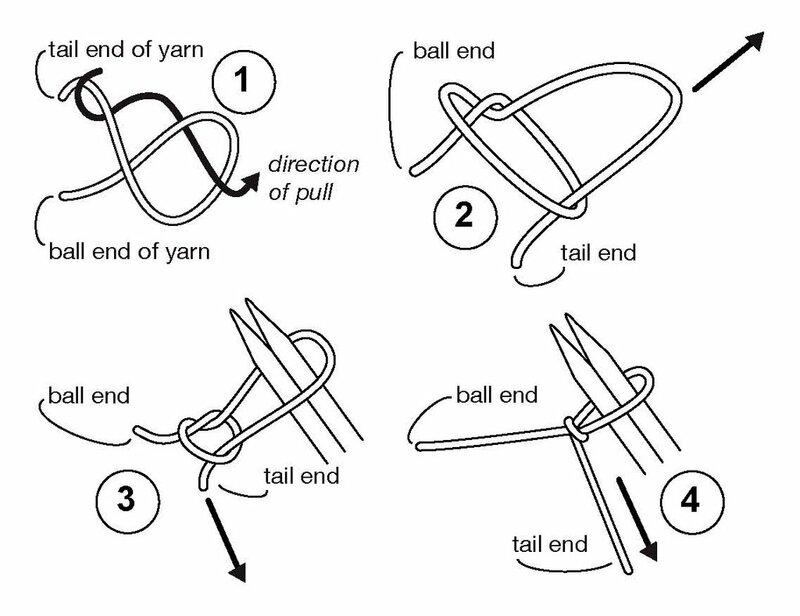 With all these flaws, when does it ever make sense to use looping-on? 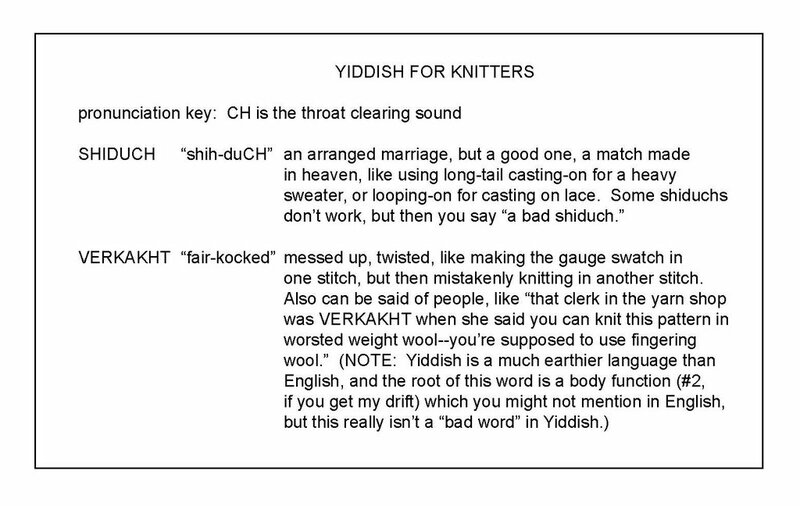 This skimpiest of all casting-on is a perfect match--a shiduch-- with the skimpiest of all knitted fabric: lace. 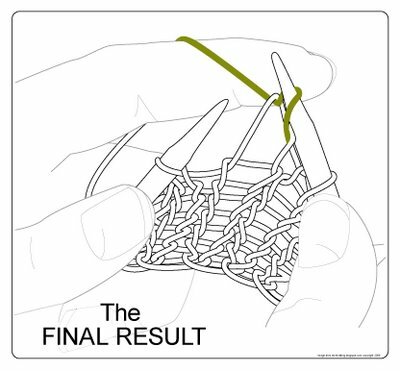 Some ladies and I at a knitting club meeting were trying to discover how a beautiful piece of Russian lace had been cast on. 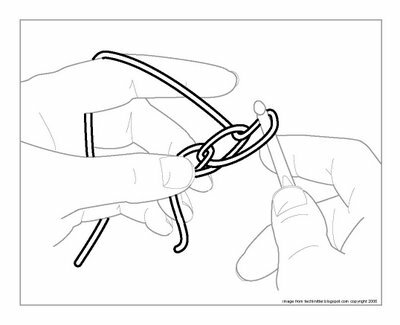 It took some time and a pair of glasses to find the looped-on edge. 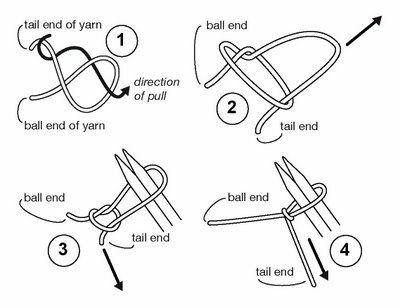 A sturdy long tail cast-on would have been easy to see, but the looping-on was nearly undetectable. 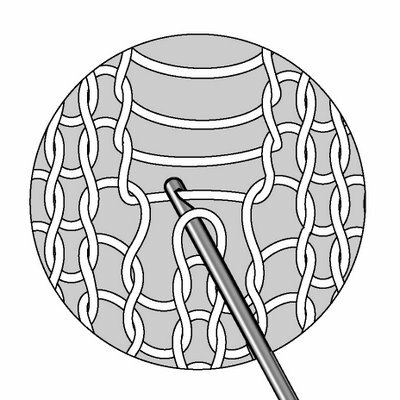 Unlike a heavy sweater, lace isn't often subject to stress, so it's irrelevant that the crossed stitches might saw on one another. 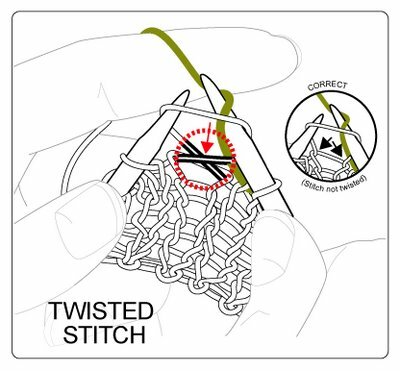 Also, lace is hardly ever made in the round, so looping-on's distressing tendency to twist--to lay on the needle all verkahkt-- is also irrelevant. 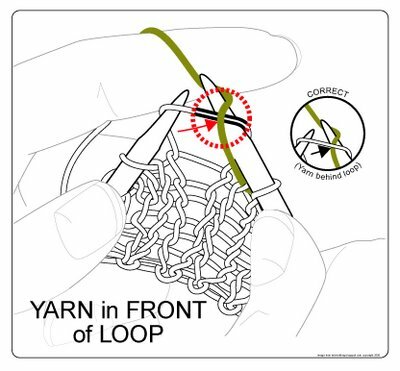 Of course, even with lace, looped-on loops tend to skitter around the needle when knitting the first row. 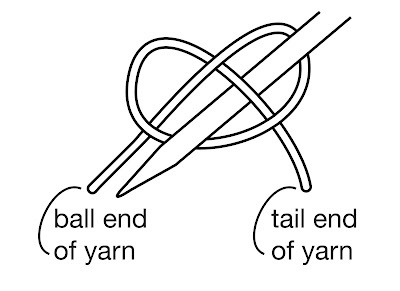 Also the loops still want to share yarn between themselves, making each stitch a different size than its partners. 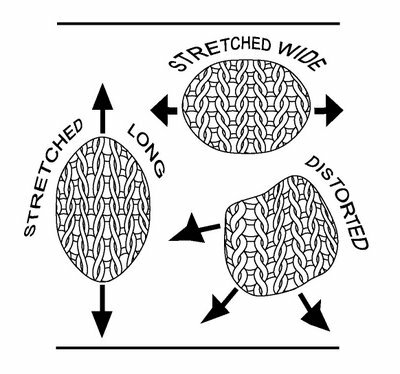 But by the time you've come to lace, you're better able to control this problem, and in any event, in lace, the result is worth it. 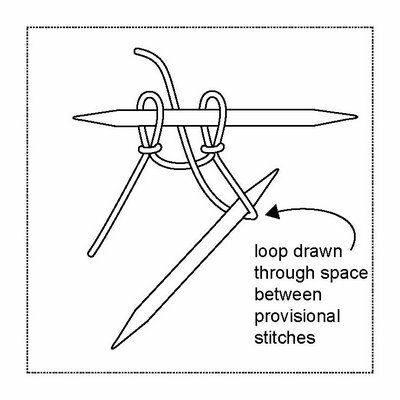 Another reason to use looping on is when you want to cast on new fabric at the end of a row (a dolman sleeve, perhaps) or bridge over previously cast-off stitches (the top of a buttonhole, for example). 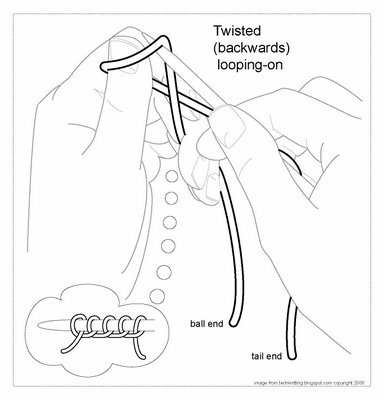 For this purpose, try backwards looping-on (illustrated below). 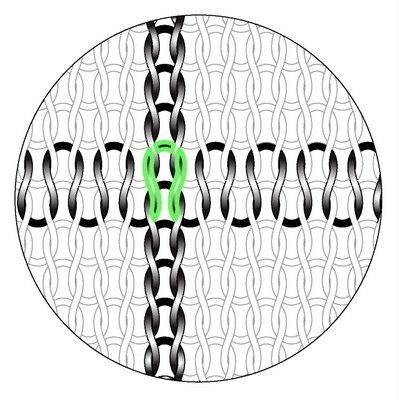 The backwards twist makes the casting-on row tighter, so it won't spread as badly as regular (untwisted) looping-on. 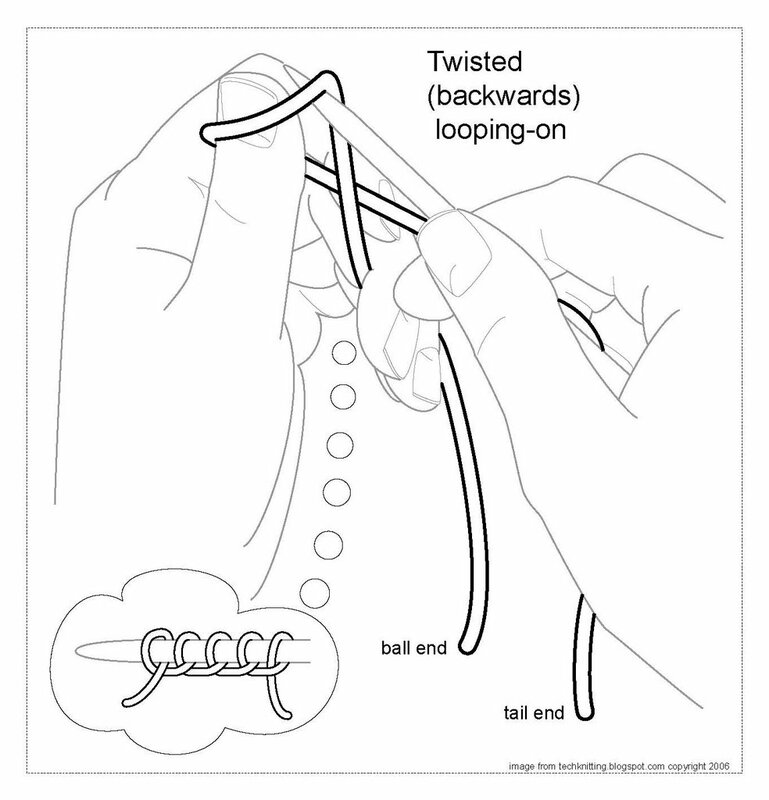 Not a lot to say: Follow the illustration above to get regular (forward) looping-on, follow the illustration below to get twisted (backwards) looping-on.